If you want to get the most out of your copy of Platinum Notes, It helps to understand the more advanced features of the program. Each week we're going to break down some of Platinum Notes advanced options to better understand what they are, and how they can help us re-master our music. This week, We're going to take a closer look at Multiband Dynamics. What do we mean when we say "Multiband Dynamics? When compressing audio for mastering, if we were to use a single band limiter or compressor, we would find that a setting that may make our kick drum sound punchy and boomy, ends up distorting our lead. Meanwhile, what makes our lead sound good, dulls out our bass drum and takes out the punch. In order to create a professional sounding Master, you need to have individual compression settings for different bands of the sound spectrum. Multiband Dynamics is the process of splitting these bands, applying compression to them, and then limiting these bands for clarity and maximum loudness. While we could split these bands by hand, Multiband compressors can do all of this, inside of just one plugin. A Multiband Compressor is a tool that will split the frequency spectrum into multiple bands that are ready for compression. Usually, there is at least one for High Frequencies, one for Mid Frequencies, and one for the low end of the spectrum. You can often set different compression attack and release times for each band and there are usually settings that allow you to change the frequency crossover of each band. This lets you define what frequencies you want in each band. Getting these settings locked in is key. 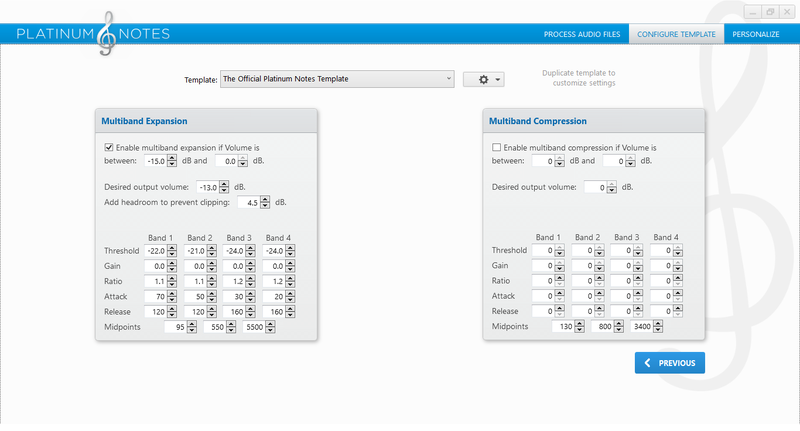 Luckily, Most Multiband compressors offer a "Solo" function so you can hear only one band at a time, for precision editing. After that is complete, They allow you to apply a limiter function that keeps your track below a specific dB level, Lowering the levels of your peaks so they will not clip. How can I make sure I have the right settings? Like so many things in music, there is no real right or wrong way to set a multiband compressor. To experiment, I suggest taking short drum samples that fit into each band (ex. Kick, snare, high hat) and adjust the settings from one extreme to the other and listen how each setting affects the short audio clips. Within no time you'll have a comprehensive understanding how you can use your multiband compressor to alter the sound of your audio. How does understanding Multiband Dynamics help me as a DJ? As a DJ, It's important to understand how your music sounds across various systems. For example, a song that is Mastered for iTunes sounds very different when played over a Club or Festival system. Having a better understanding of Multiband Dynamics allows you to craft the timbre of your tracks to sound the best, no matter where you find yourself playing. How can Platinum Notes help? Platinum Notes does all of this remastering work in a matter of minutes, so you can spend more time focusing on crafting your Mix. First, go to your settings and choose the template that best fits the venue for your upcoming show. Then go back to the analysis window and drag and drop your tracks into the program. 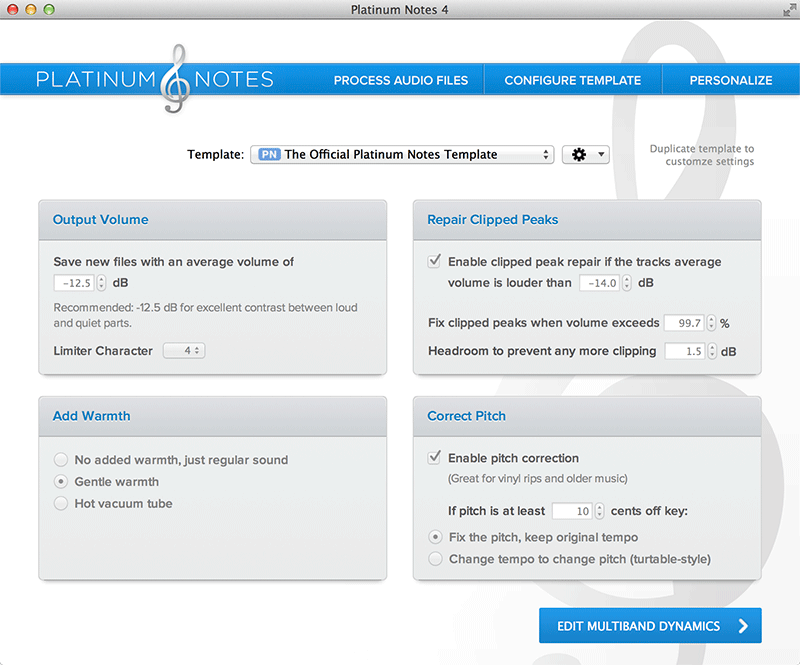 Platinum Notes will then analyze your tracks and remaster them as required. We even purchased several hours of studio time with some amazing Sound Engineers to make sure we came up with the best mastering templates possible. 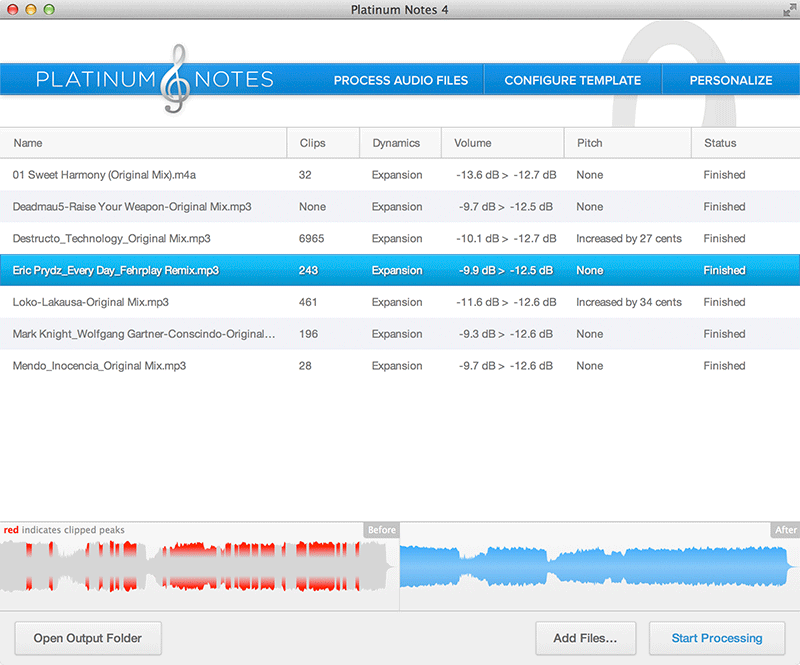 Platinum Notes will even fix files that are overcompressed, by reducing the number of clipped and distorted peaks in your tracks. Can I create my own Multiband Compressor templates in Platinum Notes? Yes, You can edit any of our premade templates by selecting one of our templates in your settings and selecting to "save as". This creates a brand new template and unlocks all parameters for custom editing. What templates do you use in Platinum Notes? Let us know in our Facebook comments.